In certain cultures, it’s customary for the dead to be buried with their possessions. For a change, how about being buried in your possessions instead? That’s the twist that William Warren put on his cheeky Shelves for Life, which function as sleek storage space during a person’s life and transform into, well, an equally sleek coffin for that person when this life comes to a close. Talk about the gift that just keeps on giving! 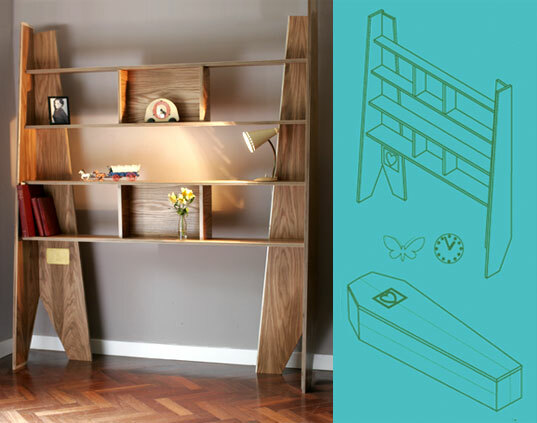 We first wrote about Shelves for Life in 2006, but thought it was important to “resurrect”, if you will, the morbid-but-practical design concept behind them. When it comes to sustainability, the term cradle-to-grave is often frowned upon. But in this context, “cradle-to -grave” is quite eco-friendly. A coffin takes a significant amount of wood to make but is ironically one of the only things that people purchase for themselves and never actually use in their lifetimes. 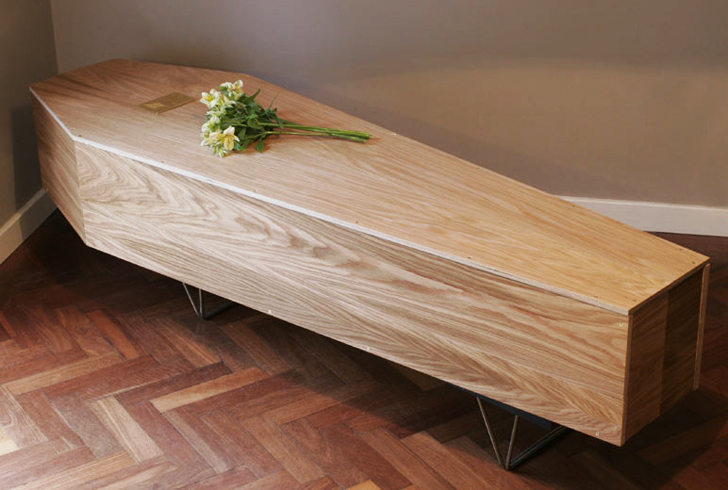 Buying a Shelves for Life system allows a person to rest in peace knowing that their coffin was repurposed from a piece of furniture that they already owned, meaning that no extra trees had to be cut down and no extra energy had to be expended (aside from the human energy it takes to assemble the coffin). Another reason to buy Shelves for Life? Coffins are expensive! And why burden your family with the design decisions associated with choosing a casket during their time of mourning? With a Shelves for Life system, they won’t have to shell out any extra dough or look through any confusing coffin catalogues: they can just divvy up your stuff, and reassemble your shelves. Creepy but interesting all at the same time. In certain cultures, it's customary for the dead to be buried with their possessions. For a change, how about being buried in your possessions instead? That's the twist that William Warren put on his cheeky Shelves for Life, which function as sleek storage space during a person's life and transform into, well, an equally sleek coffin for that person when this life comes to a close. Talk about the gift that just keeps on giving!